Will Migrate Custom Settings from vanilla AutoCAD work? Will exporting custom settings from vanilla AutoCAD and then importing them into AutoCAD MEP work? 2013 to 2013. Thanks. What exactly would you be importing? Doesn't MEP have a plain AutoCAD option? Were that the case I would expect anything you bring over would work. If I remember correctly the verticals do not have the customization export/import options as in vanilla AutoCAD. Even when verticals are run as plain AutoCAD the options are not there. I think it means a bit more work with the CUIx. 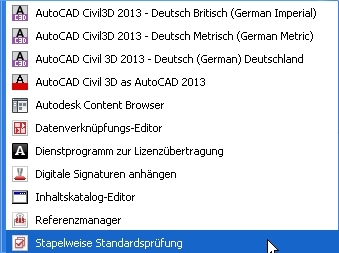 I just checked my AutoCAD Civil 3D 2013 and over START > All programms > Autodesk > AutoCAD Civil 3D 2013 in the resuling drop down menu there is no option to export or import custom settings. I'm not sure on the precise English wording as I'm running a German version and don't have a vanilla AutoCAD here in the office. I also checked all versions of C3D back to 2008 and it was the same there too. Is there an option similar to this under Start > All Programs > AutoDesk? No ReMark, such an option is not avaiailable in any of the verticals (as far as I know). A couple of years ago I checked with my dealer and he then checked through the verticals that he had and said the option was not available in any of the verticals that he had checked. He also contacted Autodesk in Munich and they said it was only available in vanilla AutoCAD. This is what I have when going in over the START button. Well that's interesting. Thanks, Tyke for the info and the image. You are more than welcome. And as you can understand German, you will understand the image text. Hint: compare the icons to get the translation if you get stuck.